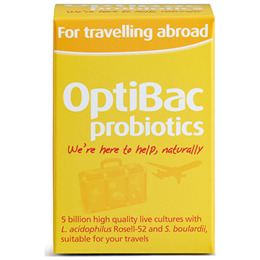 OptiBac Probiotics For travelling abroad is a supplement providing 4 well-researched strains of live cultures, including Lactobacillus acidophilus Rosell-52 and Saccharomyces boulardii, which have been tested to ensure survival through the stomach acids and bile salts to reach the intestines alive. It is possible that consuming unfamiliar food and drink in foreign environments could disrupt the fragile balance of good and bad bacteria in the gut, which may lead to symptoms such as diarrhoea. The particular strains in this blend have been scientifically proven to survive at higher temperatures, and the packaging makes it a suitable travel companion for destinations with hotter, more humid climates than that of the UK. OptiBac Probiotics formula For travelling abroad may be taken prior to, during and after travel abroad and you can make For travelling abroad a travel essential for far flung destinations such as Egypt, India and Thailand. What’s more, For travelling abroad is also free from sugars and artificial colourings which may be found in other foods or drinks containing live cultures. Choose For travelling abroad, as this natural supplement provides a shelf stable and cabin friendly formula of live cultures ideal for your travels. Stabiliser: Potato Starch, Vegetarian Capsule: Hydroxypropyl Methylcellulose, Titanium Dioxide, Live Cultures (Bifidobacterium longum Rosell- 175, Lactobacillus rhamnosus Rosell- 11, Saccharmyces boulardii and Lactobacillus acidophilus Rosell- 52), Anti-caking Agent: Vegetable Magnesium Stearate, Antioxidant: Ascorbic Acid. Take 1 capsule daily with food, preferably with breakfast. Preferably starting 3-5 days before departure, continuing during travel abroad and for a few days upon return; or as professionally directed. NB: For anyone unable to swallow capsules, the contents can be mixed with a cold meal or cold beverage. It is not recommended to give live cultures to patients who: are severely immunosuppressed, have pancreatitis, are in the Intensive Care Unit, have blood in the stool, have central venous catheters; or to post-surgical patients with open wounds, or infants with short bowel syndrome; unless under a doctor’s care. Below are reviews of OptiBac Probiotics For Travelling Abroad - 20 Capsules by bodykind customers. If you have tried this product we'd love to hear what you think so please leave a review. I've now used these on trips to India and Egypt - both notorious for upsetting the stomachs of tourists - and have been fine. Obviously I can't prove it was down to the OptiBac, but I wouldn't travel without them now. 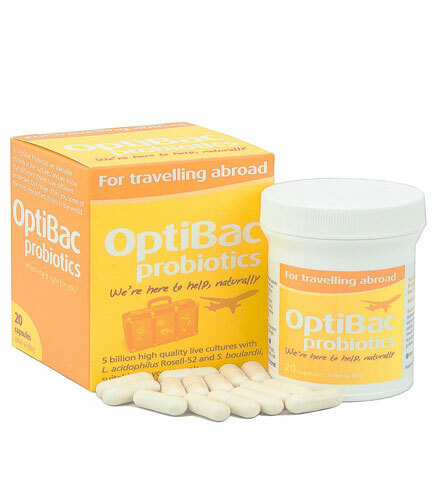 Optibac probiotics For travelling abroad is a natural supplement ideal for your travels. It contains 4 well researched strains of microorganisms which have been shown to survive at higher temperatures.